Complete the form to receive additional information, pricing, etc. Precision Indexing Tables. Maximum Size 48" x 48"
BL-LAM2424 - sized 24" x 24"
BL-LAM3636 - sized 36" x 36"
BL-LAM4848 - sized 48" x 48"
Laser Marking is no longer limited to a tiny area (galvo maximum typical 6"x6"). 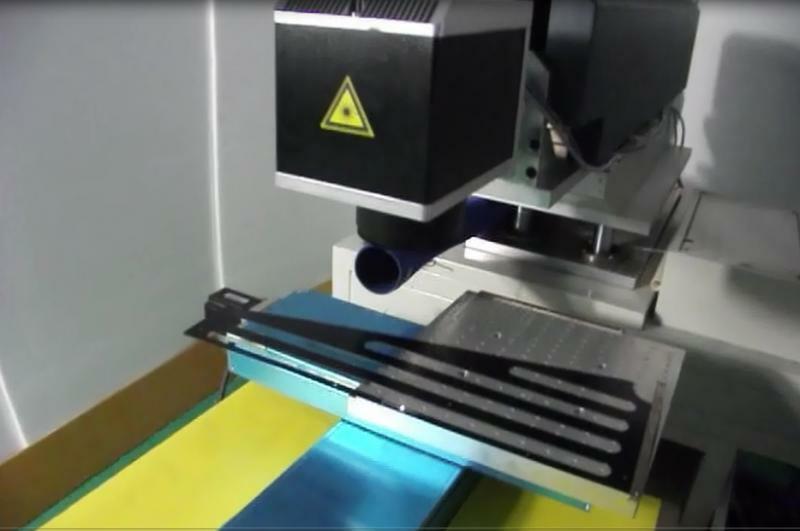 Now, with our laser marking precision indexing tables, you get a simple machine that laser marks large items. Common applications include instrument panels and control panels. Benefits of this laser machine are that very large items can be laser marked. And, laser marked within one job, so no costly mistakes due to incorrect manual positioning. Get the job done correctly and quickly, every time with this large format laser marking machine. Below: Helicopter Instrument Panel laser marked and indexed, so it ran during a single run/job from the computer. Below: 30 watt Fiber Laser marking machine with precision indexing table utilized to laser mark anodized aluminum. Bell Laser offers the precision indexing tables with fiber lasers, diode lasers, and YAG lasers. Select the best laser source for your application. Below: See videos on youtube showing this job in action. Provide details about your needs and interests so that we can reply with relevant and meaningful information.